What comes to mind when you think of comfort food? That steaming pot of chicken stew while you sit by the fire? A warm bowl of tomato soup with an extra-cheesy grilled cheese? How about anything deep fried? It can be hard to stick to a diet and put blinders on during the holidays, when cookies, candy, and comfort food are out at every family gathering. But it doesn’t have to be. The trick is to find healthy recipes that taste as good (or even better) as those typical comfort foods. 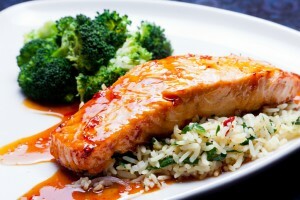 For example, if you’re a fan of crispy fish and chips, you’ll love this orange glazed salmon recipe. Coated with a sweet orange and brown sugar glaze, you’ll forget what what you’re eating is actually good for you! Salmon, considered by many to be a superfood, naturally contains abundant, high-quality protein, vitamins and minerals (including potassium, selenium, and vitamin B12), and omega-3 fatty acids, which are essential for heart and brain health. Are you ready to defeat those winter-time cravings for good? Try this recipe and we guarantee you’ll never go back to fried fish again. Place oven rack in the center of the oven. Preheat with the broiler setting on high. In a small skillet over medium-high heat, stir together orange juice, brown sugar, and garlic. Bring the mixture to a boil and cook for 4 to 5 minutes, or until the sauce is thick and glossy. Let the glaze cool to room temperature and stir in hot sauce. Place fish on a broiling pan on a rack over a rimmed baking sheet. Sprinkle the fish with salt and pepper. Brush liberally with one-third of the glaze. Broil for 8 to 10 minutes (longer for thicker fillets), basting twice with the sauce. Bake until fish flakes easily with a fork. Garnish dish with thinly sliced green onions and serve. This simple glaze is sure to be a new family favorite. It’s sweet, tangy punch perfectly complements the tender salmon. Serve it with stir-fried broccoli or roasted carrots and potatoes to complete the meal. You’ll be dipping all your veggies in the remaining orange glaze by the last bite. Stay warm this holiday season!